If the economy keeps growing until the summer, it will notch the longest expansion in modern U.S. history, surpassing the boom of the 1990s. The Brookings Institution’s Metro Monitor has tracked the effects of the recession, the slow recovery and expansion for the 100 largest metropolitan areas. A new report shows how they performed in 2017, the most recent year for which complete data are available, and the decade starting in 2007. • Fifth nationally in prosperity, including standard of living, productivity and average annual wage, from 2016 to 2017. For the decade, we ranked No. 2. • Ninth in growth, including of jobs at young firms. No. 11 for the decade. • Seventh in inclusion, changes in employment and income distributed among individuals. For the decade, we ranked 34th. We topped the annual ranking for the subset of percentage change in median wages, and were No. 7 for the decade. 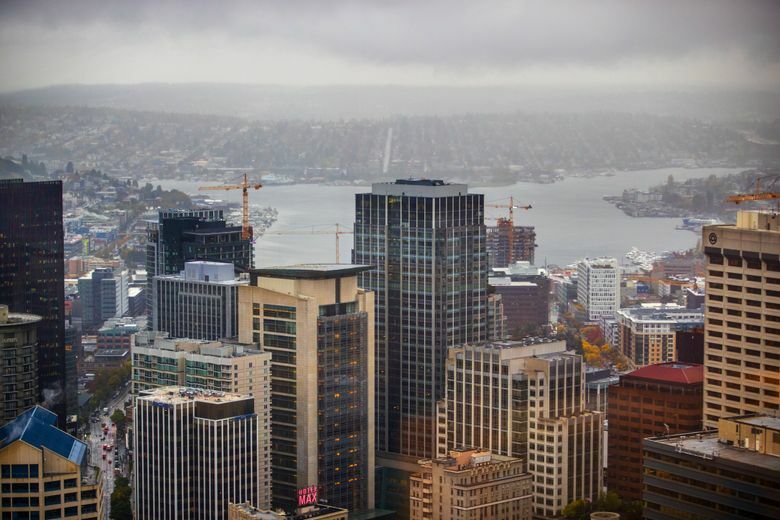 In all three areas, metro Seattle far outperformed the national average. Less happily, Seattle-Tacoma-Bellevue ranked 57th for economic inclusion by race from 2016 to 2017, and 67th for the decade. The change in the white/non-white income gap placed metro Seattle at 82nd among 100 metros nationally. Only Portland posted a statistically significant shrinking in measures of racial gaps between 2016 and 2017. • Boise ranked 72nd for prosperity, 58th for growth, 97th for inclusion and 12th for racial inclusion. • Portland was 21st for prosperity, 17th for growth, 21st for inclusion and 32nd for racial inclusion. • Spokane was 37th for prosperity, 69th for growth, 27th for inclusion and third for inclusion by race. (According to the most recent census data, Boise’s Ada County registered 85 percent white, non-Latino, while Spokane County’s white, non-Latino population was 84 percent vs. King County’s 60 percent). Metros such as Anchorage didn’t rank among the 100 largest tracked by Brookings. Some caution is in order. For example, the 2007 to 2017 performance includes the most dangerous contraction since the Great Depression and the long slog out of it. And one year’s snapshot doesn’t constitute a trend; 2017 was before the effects of the Trump tariffs. This recovery and expansion are different from any we’ve seen since the end of World War II. The recession peak unemployment nationally was the second-worst (topped only by the early-1980s Fed-driven downturn to kill runaway inflation). After a slow-but-steady recovery, unemployment is lower than any time since the 1960s. But that’s the big picture. As the Brookings report shows, many places haven’t fully recovered — and these are metro areas, not declining rural America. These include metros in the Rust Belt and some in the Sun Belt that were badly mauled by the housing collapse. Also — and this isn’t in the report — this expansion feels very different from the one it is racing to beat, the 1990s. Then, layoffs and restructurings were plentiful, but so were jobs. And they were good ones, with pay rising substantially for the first time since the mid-1970s. It was the dot-com era, but the U.S. economy also boasted industries that have since nearly been obliterated, from machine tools and textiles to the newspaper business. Regular readers know the headwinds this expansion has faced: Federal austerity mandated by Congress; the growing shift to low-paid service jobs; continued industry consolidation and giants with enormous market power; the lack of major breakthroughs that created large numbers of well-paid jobs (but we got iPhones! ); the sluggish growth that former Treasury Secretary Lawrence Summers labeled secular stagnation. Political polarization is high. Amid these complex circumstances, the stark differences between a few elite metros and the rest stand out. Not that places such as Seattle should take their success for granted. A century ago, today’s struggling cities such as Buffalo, St. Louis and Cleveland were economic powerhouses.